The UCAS personal statement: “just enough rope for a hanging”? The alternative for many nations is appropriately contextualised attainment data. Rather than turn to non-academic criteria to choose between eligible applicants, universities in both Holland and Greece have experimented with lotteries to distribute places on oversubscribed programmes. Meet your course’s entry requirements and your name goes into a hat with every other applicant who reaches that threshold. No gaming the system with interview coaching, LAMDA examinations or extravagant work placements. 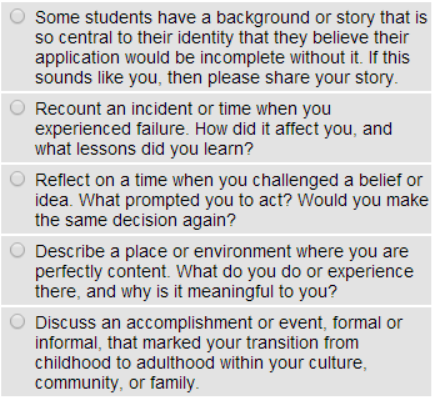 Even in the largely decentralised US admissions system, applicants must respond to ‘prompts’, including those below, that are designed to make the process fairer. Such prompts, rather than encourage applicants to cash in on past opportunities, call for focused, candid and reflective responses. College websites in the US reassure applicants that statements will be read “in their true context” (Princeton), and justify the use of non-academic indicators in terms of a “long history of encouraging diversity” (Brown). 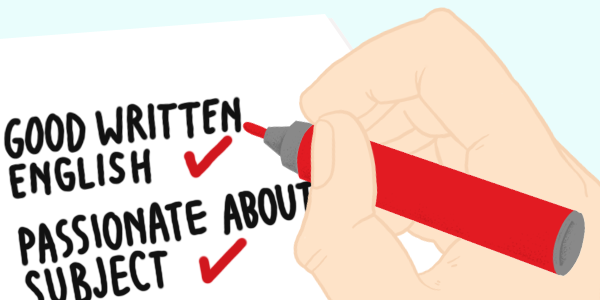 Last year, I published Sutton Trust funded research demonstrating that equal-attainment students submitted very different personal statements. Basic linguistic errors (such as spelling errors and apostrophe misuse) were almost three times more common in statements submitted by applicants attending sixth form colleges than by those attending independent schools. For some candidates, work experience meant school-facilitated day trips and paid Saturday jobs; for others, it involved shadowing public figures and undertaking high-prestige placements. My findings resonated with a 2010 survey by the Education and Employers Taskforce showing that 42% of young people from independent schools felt their work experience helped them get into university, as opposed to only 25% of those from comprehensive schools. Whether this year’s A-level results bring good news or bad for individual students, questions remain about whether the half a million or so personal statements written every year represent an efficient use of time, energy and resource, either for schools and colleges or for the higher education sector. A growing body of evidence suggests that non-academic indicators, rather than bringing equality to the selection process, further advantage those applicants already favoured by school type and socio-economic background. This entry was posted in Admissions, Personal Statement, Social Justice and tagged Common Application, Education and Employers Taskforce, Lotteries, Pearson, Selection, Sutton Trust, UCAS. Bookmark the permalink. ← What can defuse the student loan time bomb?